The latest round of Lego Ideas sets have gone through the cooker and the next set has been announced: Lego WALL-E. Though that set idea looks pretty amazing, many have been waiting for Lego to make a decision about a couple sets that were carry-overs from the last review process. It has been decided, Lego is going to produce an official Doctor Who set! First, lets go over Lego Ideas #11 - WALL-E. This gorgeous submission was made by Angus MacLane, a Pixar animator and director who actually worked on the WALL-E film. This model is absolutely fantastic and though it won't necessarily make it to production looking exactly like this, I'm going to wager that it will be pretty close as this build is solid. I don't think it could get any better than this. Now, Doctor Who - Lego Ideas #12, cause that's what you guys care about, right? 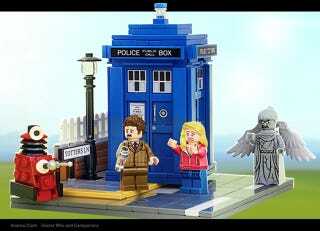 During the November 2014 review process it was announced that Lego was still evaluating two Doctor Who projects. They have chosen Doctor Who and Companions, which I think was the better of the two projects. Andrew Clark did some really great work on the design and play-ability of the set. Andrew even made a great video showing the functionality of the TARDIS and the set in its entirety. As with all the Lego Ideas sets, though many of them make it though with only minor changes, keep in mind that what you see might not necessarily be what you get. There have been a couple instances where the design model looked way better than what was actually put up for sale. On the other hand, we have models like the Ghostbusters Ecto-1, which looked to be improved over the original design. We're still working out the final product design, pricing and availably for both the WALL-E and Dr. Who and Companions LEGO sets, so check back on LEGO Ideas later this year for details. I'm going to guess that because the process was already in the works with Doctor Who that we will probably see that set turn around pretty quick. It may even show up before WALL-E. Using the last round of sets as an example, Lego Birds was almost an instant turn around coming out just weeks after the announcement November 7th, 2014, while we are still waiting on The Big Bang Theory set to hit the shelves.